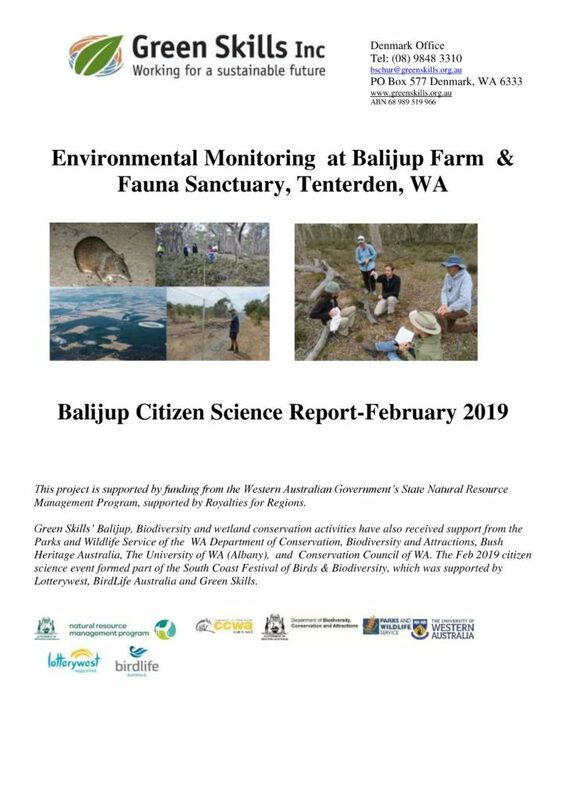 In March 2019 , Green Skills completed a State 2 project for the Balijup project aimed to build community capacity in the eco-restoration of the 919ha Balijup property near Tenterden with its Fauna Sanctuary (a 111ha fenced feral predator free exclosure into which Quenda (Southern Brown Bandicoots) and Coomarl (Brush tailed possums) have been successfully established) Green Skills has partnered with Conservation Council of WA Citizen Science team, other groups, property owners and many volunteers in community capability building in terms of eco-restoration, feral animal control, and citizen science community research into native fauna recovery. installation and monitoring of more than 35 Phascogale nesting boxes, research into feral animal baiting and further fauna research and monitoring on Balijup. The project facilitated improvements to the capacity of both Green Skills and Conservation Council, and their key project staﬀ, to plan and execute fauna and environmental monitoring at Balijup. It also provided hands on practical experience to over 30 volunteers, several of whom were university graduates or current undergraduates very keen to get hands on experience with fauna trapping and environmental monitoring. Green Skills was able to gain a lot more knowledge and technical capability in relation to implementing a Brush tailed Phascogale conservation project. Important progress has been made in developing the foundation for implementing a feral animal control program at Balijup. Future proposed priorities for the Balijup Citizen Science progranm t include 1) Ongoing camera monitoring 2) Further cage trapping program events 3) Ongoing monitoring of Southern Heath Monitors within the Sanctuary and relocation of some of these 4) Control of rabbits and Kangaroos within the Sanctuary 5) Ongoing monitoring of the Sanctuary fence and maintenance of the ﬁrebreaks 6) Ongoing monitoring and maintenance of the phascogale boxes and development of further research. 7) Ongoing monitoring of the other phascogale nesting boxes on three properties. 8) Other vegetation, bird and wetland monitoring both within the Sanctuary and Balijup property. 9) Further development of a feral baiting program for the whole of Balijup property. This project is supported by funding from the Western Australian Government’s State Natural Resource Management Program, supported by Royalties for Regions. Green Skills’ Balijup, Biodiversity and wetland conservation activities have also received support from the Parks and Wildlife Service of the WA Department of Conservation, Biodiversity and Attractions, Bush Heritage Australia, The University of WA (Albany), and Conservation Council of WA. The Feb 2019 citizen science event formed part of the South Coast Festival of Birds & Biodiversity, which was supported by Lotterywest, BirdLife Australia and Green Skills.